As its title suggests, Kenji Mizoguchi’s Sisters of the Gion follows two siblings who discover the impossibility of happiness as geishas in 1930s Kyoto. Compared to its immediate predecessor, Mizoguchi’s Osaka Elegy, it feels just as despairing, but doubly cynical. This deeper discontent emerges perhaps only because in Gion the director focuses on women who have fallen further down the social ladder. Isuzu Yamada, who starred as the downtrodden woman at the center of Osaka Elegy, returns as the lead here, only to be subjected to further abuse. She plays one of two very different sisters. One strives to be ideally passive and subservient to the men that she serves, the other seems a prototypical model of feminism, willing to put herself first. Not surprisingly, though, both suffer. Although these women are conniving, manipulating male patrons, both old and new, Mizoguchi is sure to point out that this is not due to their malicious natures. Rather, as geisha, they are cogs in a social machine, forced to subsist on whatever scraps they can wrest from the men who take them for granted. Gion examines the codependent relationships between geisha and their patrons with such precision and coldness that it’s impossible to blame personal foibles for their inevitable collapse. Nonetheless, the film is still capable of evoking an incredible amount of sympathy for all of those involved in these unwinnable scenarios. Sisters of the Gion is a brief movie, which is impressive considering how much of Japanese culture its critique assults, but it must be conceded that it loses a little of its potential richness as a result. 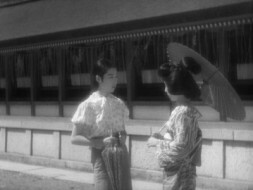 Although motivations are made clear, character relationships here become slightly schematic in a way that is not the norm in Mizoguchi’s work. The procession of pain is too neatly constructed to be entirely devastating. Nonetheless, the director’s style is always working overtime in highlighting the relationships between people. Even in the very first sequence, the camera glides from backstage manual laborers, to an auction house, where men clamor to buy the remaining property of a fallen businessman, to the chambers of the proprietor and his wife, as she accuses him of squandering her dowry. From this, one gets a strong sense of the interconnectedness of relationships in Japanese society. Because of this eye on the populace that allows such horrible arrangements to be made in the first place, the defeated tirade that closes Sisters of the Gion packs considerably more punch.